Stargazers will see quite the sight late Thursday night. Stargazers will see quite the sight early Friday morning. A crescent moon will be accompanied by Saturn. This means the planet will appear very close to the moon during the predawn hours. In order to see the planet, it's best to head outside between 3:17 a.m. and 7:06 a.m. The closer to dawn the better. First, look southeast and find the moon. 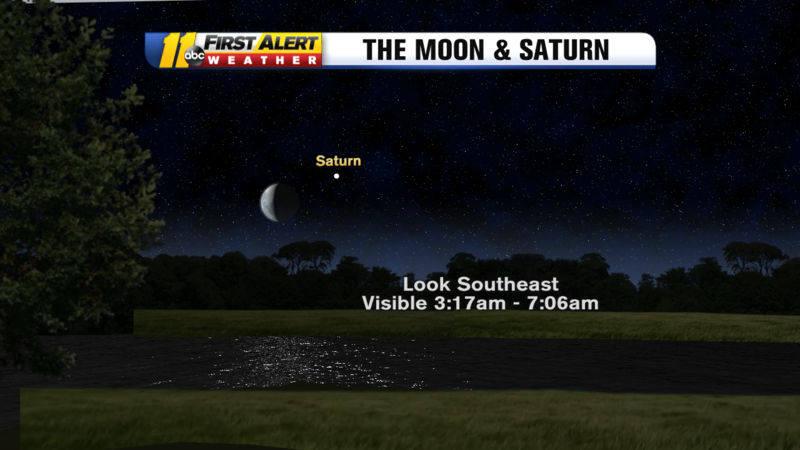 Then, Saturn will appear as a bright star just to the upper right of the moon. If you want a closer look at the planet, this is the time to bring out the telescope. In order to get the best view, try to go to a location away from city light. Skies will be clear so this will be a great time to go outside and see the ringed giant. If you plan on staying outside, make sure to bundle up. Temperatures will drop to the low to mid 40s.